Kobo Writing Life interviewed Jean Leggett about the next frontier for storytellers – interactive fiction and interactive story games. 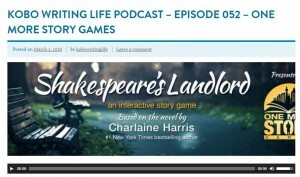 To listen to the podcast, visit http://kobowritinglife.com/2016/03/02/kobo-writing-life-podcast-episode-052-one-more-story-games/. There have never been more opportunities for writers and storytellers than ever in the history of publishing, and Episode 052 of the Kobo Writing Life Podcast demonstrates yet another amazing opportunity that exists for writers. KWL Director Mark Lefebvre interviews Jean Leggett co-founder of One More Story Games, a company from Barrie, Ontario that has developed a storytelling platform with a team of gamers, geeks, storytellers and programmers that creates a community for collaborative story game opportunities.